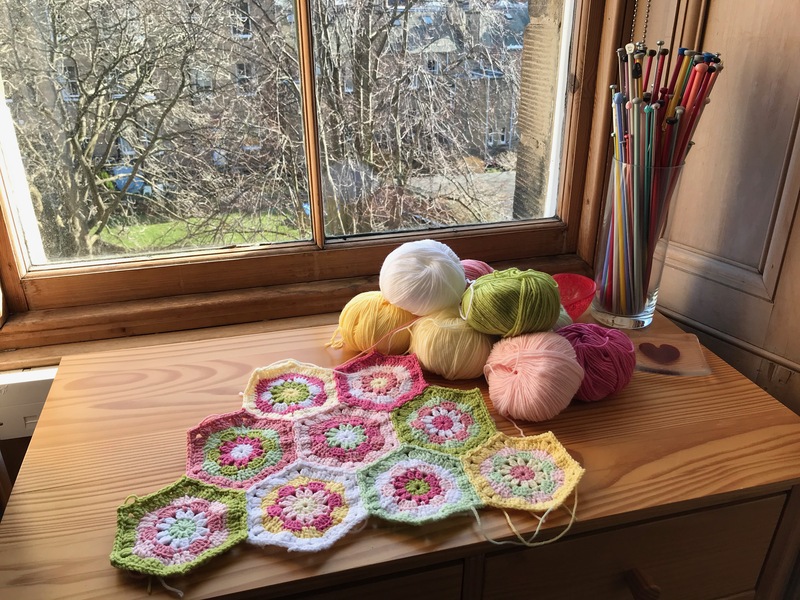 I very much appreciated all the generous comments and likes in response to my last post about my current knitting and crochet projects, so much so that I feel emboldened to share one further bundle of joy. 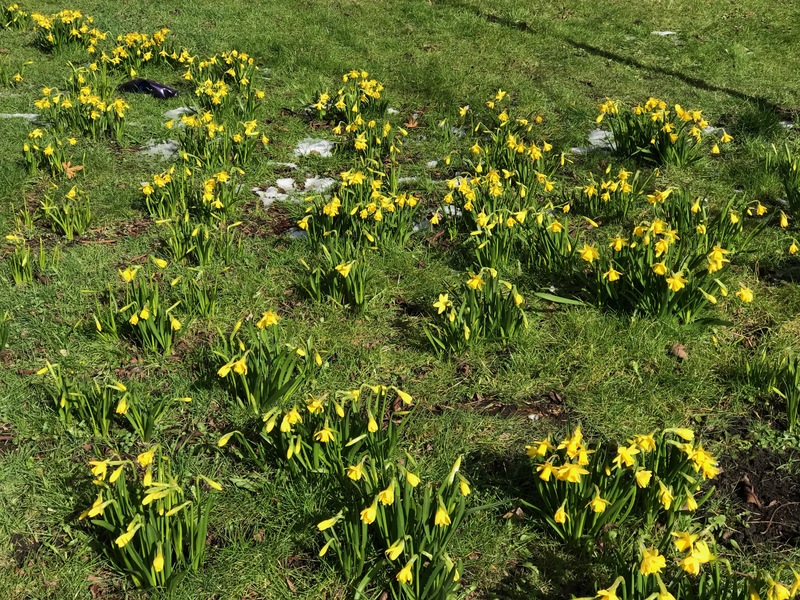 The weather here in Edinburgh, as for many other places, has continued to be very cold and grey and yes the snow even came back this weekend. 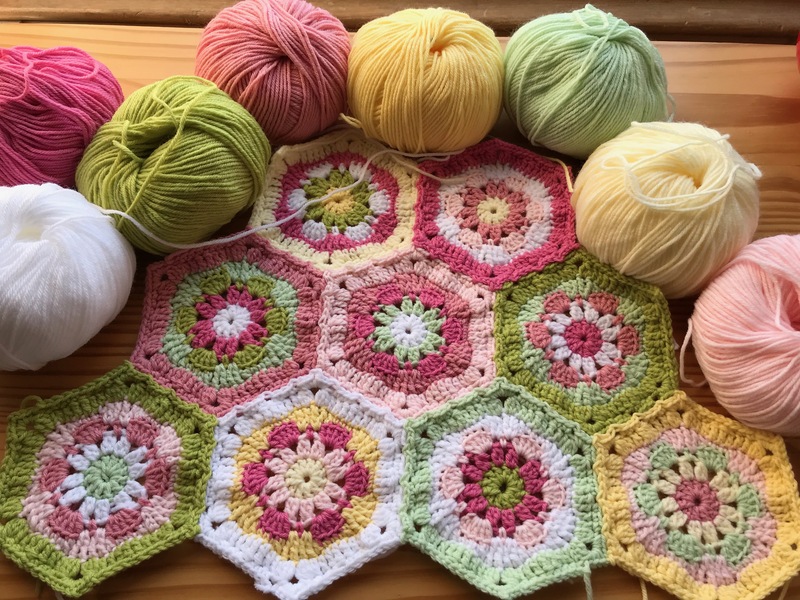 How delighted I was, then, to be working with all these beautiful spring colours on the development of a new crochet motif. I recently came across this picture on Flickr and knew instantly that the antidote to the current weathery blues would be to create my own version. I hunted around a bit for some suitable yarn and happened upon this suggested yarn pack from The HomeMakery. I added to it an additional green, pink and cream from the same yarn range to give me the 8 shades pictured above. All that remained was to decide upon a pattern. 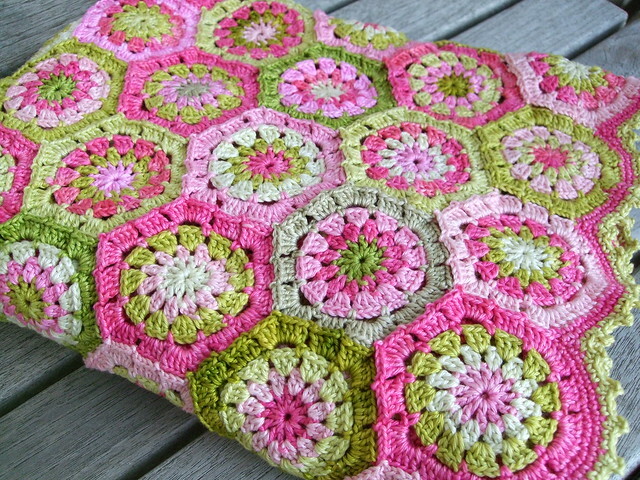 I love the hexagons in the original photo but I wanted my throw to be a bit more blossomy. I also wanted to create a sense of flowers and petals without the design being too lacy. For a throw I wanted a relatively dense fabric for plenty of snuggly warmth. As you can see from this next picture, I had a lot of fun working up various samples. Sitting with all these lovely colours in front of me while also looking out at the blizzards made my spirits soar! I gradually homed in on a motif which gave me all the elements I was looking for. One interesting conundrum was the extent to which I could avoid make the inner lines too straight. This next photo shows you the, albeit subtle, difference between the straight-edged dark pink row (on the right) and the slightly more wavy dark pink edge on the left. There is not much in it, I accept, but I felt that the softer lines in the motif on the left were preferable. 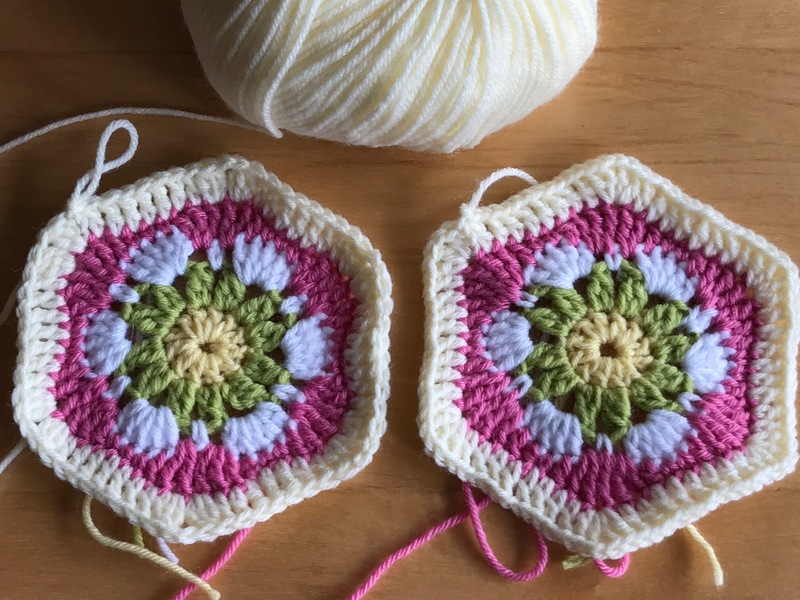 I also wanted to develop a means of joining the motifs as I went along in a way which avoided too much openwork in the motifs’ outer stitch rounds. In these next photos, you can see that I managed to achieve this aim. It also gives you an idea of how the finished throw will look. Obviously, there is a still a long way to go. But with these delicious spring colours to work with, it will be no hardship at all. 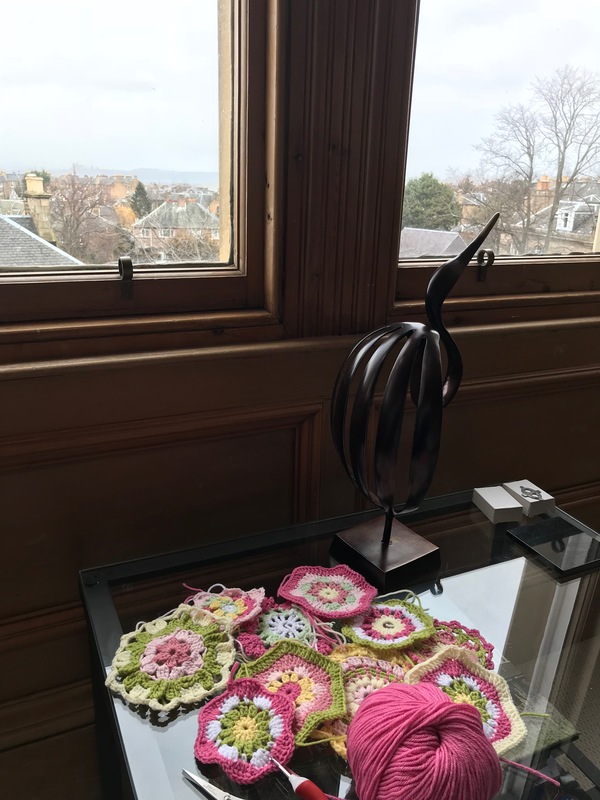 This entry was posted in Edinburgh, Knitting & Crochet, nature and tagged afghan, blanket, blossom, colour, crochet, daffodils, Edinburgh, hexagon, knitting, motif, snow, spring, Throw, weather. Bookmark the permalink. That looks so Spring coloured, lovely. A great way to let Spring in your home indoors! Wow–that’s really, really pretty! What fun it’ll be to work on! 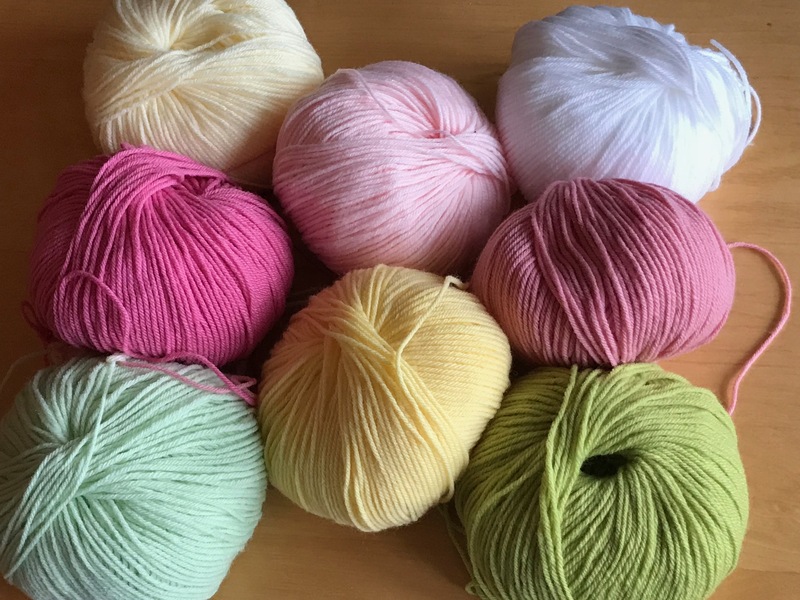 I agree that one fine thing about being a knitter/crocheter/weaver, at this time of year, is that we can sort of create our own springtime, with our color choices! Colours, taking away that miserable weather you all seem to be getting over there. I look forward to seeing how your crocheting comes along. Thank you! What sort of weather will you be getting in your new part of the world – is it always hot or more varied? Summer is here so it’s around 34 at the moment, I still have about two and a half months left of it and the air con isn’t as cold as hoped! I wonder if the heat is something you will get used to over time – it will be interesting to see. Hopefully, as long as I sit next to a fan all day, I will be happy. Wow, Liz. That’s gorgeous! I can hardly wait for the completion.